As Halloween approaches the ghost and ghouls will be out and about so it was a good time to take a look back at some of the original monsters of Hollywood. Universal Studios brought Dracula, The Wolfman, The Mummy, and more alive in ways people never thought imaginable with their classic film series in the 1940's and beyond. The monsters are still loved and inspiring artists and people throughout the world today with Universal currently hoping to reboot the franchises with a new Mummy film in 2017. With their popularity comes merchandise and that means toys and more! 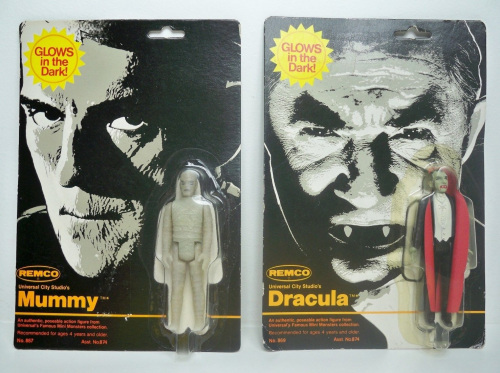 Here is a look at some unique and cool toys based on the famous Universal Monsters. In 1997 Burger King included these neat little toys in their kids meals. What kid doesn't want to play with monsters? They featured four of the monsters as you can see and make for a neat not to expensive set to collect for monster hunters everywhere! 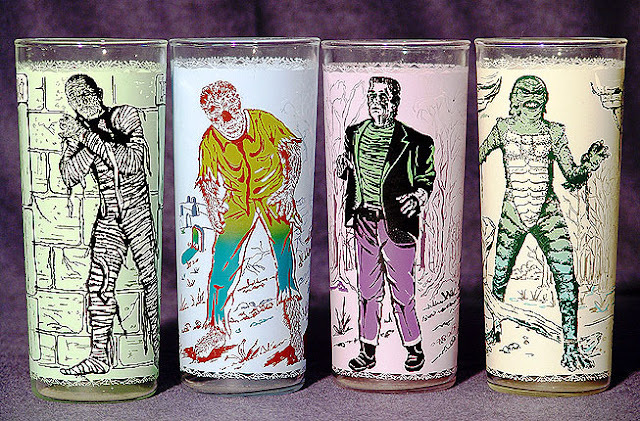 These very scary and cool drinking glasses were given away it seems at gas stations around 1963. That's about all that seems to be known about them but they are very sought after today by glass collectors. These Funko Reaction figures were made exclusively in a black & white mold with packaging for the 2015 New York Comic-Con. Extremely cool peices limited to 2000 each and a must own for Universal Monster collectors! Monsters gotta drive cars right? 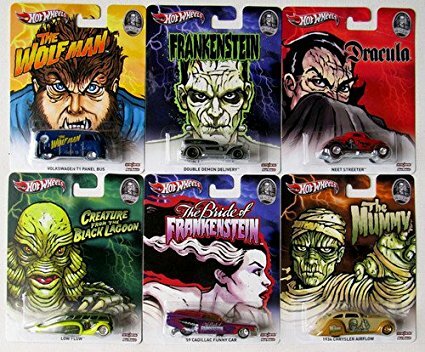 Well maybe not but what kid doesn't love Hot Wheels and having his favorite monster inspired cars in his collection! These toys inspired Funko's Reaction figures but in 1980 toy buyers weren't buying them due to a little movie called Empire Strikes Back owning the toy aisles. 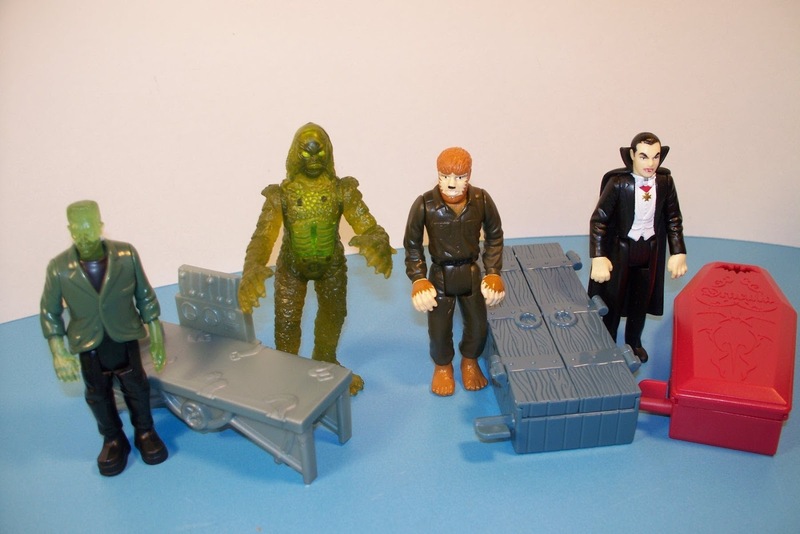 They were called mini-monsters due to the fact there was also a 9" line of figures as well. They even released them in tglow in the dark versions! These today are hard to find and cool figures to have in any collection. 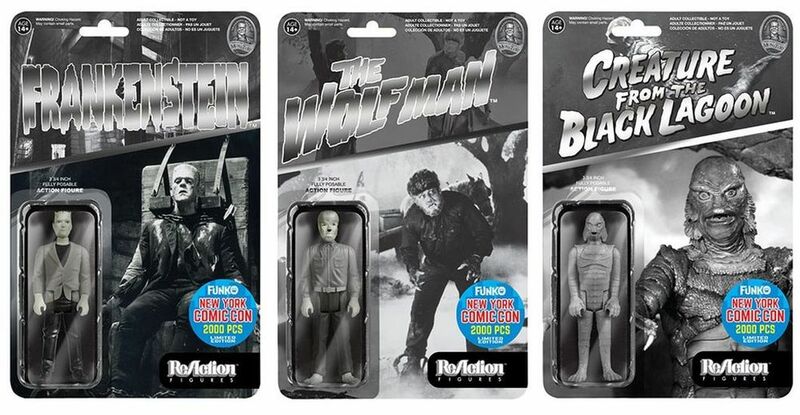 Universal Monsters will continue to haunt generations to come and you can bet more toys, glasses, and other cool merchandise will fill collections everywhere as well.